The Chiropractic Health Center offers a warm, inviting, family-friendly atmosphere. There’s a kids’ area with a train table where they can stay busy while Mom or Dad is seeing Dr. Birchler. If you have small children, our team will be happy to keep an eye out for them during your appointment. First-time patients are welcome to fill out the paperwork online before their appointment. You’ll sit down with Dr. Birchler to discuss what’s brought you in and what you want to accomplish. Next, we’ll perform a careful, detailed evaluation of your spine. X-rays can be taken on-site if necessary. We’ll wrap up this appointment in 20-40 minutes. 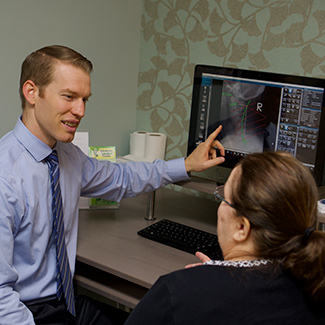 When you return, Dr. Birchler will review the findings from your examination. We’ll tell you about the problems we’ve identified and the amount of care you’ll need to get better. You’ll receive your first chiropractic adjustment and be on your way in about 15-20 minutes. Once we understand your needs and you’ve decided to proceed with care, we’ll go over the details with you by reviewing insurance coverage and financials. This appointment takes 15-20 minutes. Regular visits can vary in time depending on your care plan. If you need an adjustment, it’ll take just a few minutes. You may have in-office exercises or rehabilitation to perform that takes longer, about 20-30 minutes. Please rest assured that you do not have to continue care forever once you start. There are many people, though, that go back to the same stressful environments that caused their original problems. To maintain their health and avoid future problems, they return to our office and enjoy doing so because of the many benefits ongoing chiropractic care provides. Those with more advanced problems can manage their condition to have the highest possible life quality with continued care. There are many events held at our practice. Our flagship talk is The Secret to Advanced Healing, which all patients are welcome to attend. We’ll answer any questions you might have and give you a new perspective on health, detailing our practice’s role in your life. There are also several nutrition-related classes held throughout the year. Watch Our Video Below to View one of our Many Events! Contact us today to find out more! Dr. Birchler is in-network with many insurance plans and accepts Medicare.